So far we've seen only leaked snippets of the Samsung Gear S2 and a short teaser trailer from the company itself. That's about to change today. 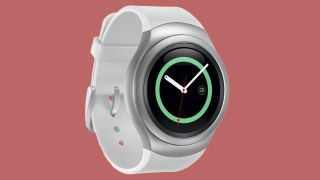 Just ahead of IFA 2015, Samsung has released the official specs for the round faced smartwatch and as speculated before, revealed there will indeed be two versions of the wearable along with a 3G watch. There's no real difference between the watches except for the dimensions with the Gear S2 measuring 42.3x49.8x11.4mm weighing 47g and the Gear S2 Classic measuring 39.9x43.6x11.4mm weighing in at 42g. The standard S2 with 3G capabilities is the biggest of the bunch in terms of size and battery: 44.0 x 51.8 x 13.4mm weighing 51g with 300mAh. The S2 and S2 Classic both sport 250mAh batteries with Samsung saying they should last 2-3 days depending on usage. All the smartwatches will support wireless charging through a wireless charging dock. Further details on the charging haven't been announced. Design-wise, the Gear S2 Classic is likely aimed at the Apple Watch Edition crowd and will ship in a black case with a leather band. The Gear S2 will ship with a dark gray case and dark gray band or silver case with white band. Again, the innards of the Gear S2 Classic (pictured below), Gear S2 and Gear S2 3G take the same shape. All three wearables boast a 1.2-inch circular Super AMOLED 360x360 screen with 302ppi. Each watch will run a Tizen operating system with a dual core 1.0 GHz chip, 4GB internal memory and 512MB of RAM. The watches aren't waterproof and all have a IP68 rating meaning they're only dust and water resistant - specifically they can endure light splashes of water. In terms of sensors, the Gears will come with an accelerometer, gyroscope, heart rate monitor, ambient light sensor and barometer. Fun features? Seems like it! Seems like there's no shortage of functionality on the Gears as well. Through Wi-Fi, you'll be able to check emails, notifications and messages while the 3G version will of course, let you make calls through e-SIM with voice capability. Preset text, voice Input, emoticons, keypads will be on hand as well, just like Android Wear and the Apple Watch's OS. The Gear S2's will also come with built-in NFC tech to enable mobile payments. Though it wasn't noted, we'll likely see Samsung Pay incorporated just like Apple Pay on the Apple Watch. Samsung is working with a wide selection of partners across different industries to expand the usability of its wearables, including smart car keys, residential room keys and remote controls to manage a connected home. In addition to S Health, Nike+ Running, new fitness functions like the 24-hour activity log lets users view daily activity progress and patterns at a glance. It will also send reminder updates to motivate users to stay on track with their fitness goals. S Voice, voice memo, Find My Device, power saving mode, safety assistance and privacy lock are other features you can look forward to where a music player and gallery round out the media functions. You'll also find Schedule, News, Maps & Navigation and Weather in the Tizen OS. The round, rotating bezel with Home and Back buttons which were also previously mentioned, will help you navigate the watch. No prices or release dates have been revealed just yet but hopefully IFA will yield more juicy details.